Junk is inevitable. The day always arrives when you look around and realize how much you are surrounded by old, unused, outgrown, outdated, faded and sometimes, broken, STUFF! When you call 1-800-DECLUTTER to remove your junk, you’ll “get green” in several ways. First, 1-800-DECLUTTER saves you “green”. Using the largest trucks available for junk removal services and offering the lowest prices for hauling junk, 1-800-DECLUTTER offers customers the best value. Second, green means “go”. When you call 1-800-DECLUTTER, your part of the clean-up job is done. You are free to get on with your day.You can trust our professional, uniformed staff to remove unwanted items from your home or business efficiently and safely when it’s convenient for YOU. Just point them to your clutter, and they’ll do all the rest. Once the truck is loaded, our staff will sweep up. No stress for you! Finally, by calling 1-800-DECLUTTER, you are doing your part in “being green”. 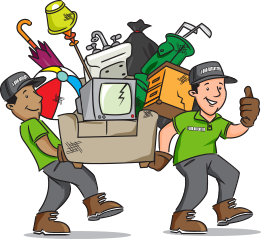 Removing junk with 1-800-DECLUTTER is a responsible decision that is gentle on the environment. At 1-800-DECLUTTER, we put top priority on finding your old items a new home; we donate as much as possible. Once we have donated all items that possibly can be reused, we turn to recycling. We have great respect for the environment and minimize junk going to landfills. All with the assurance that we donate as much of your unwanted as possible, minimizing the potential impact on the environment. And, most of all, Zero Stress! At 1-800-DECLUTTER, we understand your busy lifestyle. We work around YOUR schedule to make our Junk Removal and Dumpster Rental services the most convenient in the industry. Give us a call today and you’ll see that our customer service and pricing are second to none. Your happiness is always 100% guaranteed!